The Driftr experience is anchored by an interactive map which is a pivot for finding new places to travel or for contributing your own trips. 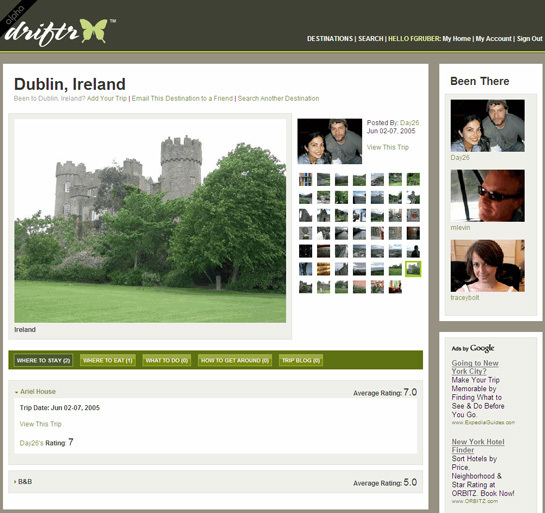 Once you have selected a location you can view photos, places to stay and other travel information. In addition, you can also contribute your own trips to the site with photos, ratings, places to stay and other information to help build the Driftr community. Trip photos can be pulled in directly from Flickr saving you time spent re-uploading them. Overall, Driftr offers a very soothing design which contributes to a solid user experience. With all the fanfare for Dopplr, a travel community that focuses on plotting where you are going, Driftr is a perfect compliment as it offers a place to plot where you have just traveled and then share it for others to see.